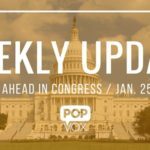 It’s going to be a light week in Congress, with the House staying out due to the DC snowstorm, and no Senate votes until Wednesday evening. Washington-area federal offices will also be closed on Monday. The Senate is in Wednesday evening and will begin consideration of bipartisan energy legislation. The next votes in House will be February 1. The chamber was scheduled to re-vote on limits to the President’s ability to lift sanctions on Iran (H.R. 3662), which was previously vacated because 137 Members were late for the vote. The House was also set to vote on overriding the President’s veto of the Reconciliation bill that would have repealed parts of the Affordable Care Act (Obamacare) and removed federal funding for Planned Parenthood. This bill prohibits the President from removing sanctions on foreign financial institutions until the President makes two certifications to Congress: (1) that the institution has not knowingly facilitated transactions or provided significant financial services for or on behalf of Iran’s Revolutionary Guard Corps or any of its agents, a foreign terrorist organization, or a person whose property or property interests are blocked pursuant to the IEEPA in connection with Iran’s proliferation of weapons of mass destruction. (2) that the institution no longer knowingly engages in illicit or deceptive financial transactions or other activities. As you know, “reconciliation” is an expedited process for special bills that reduce the budget deficit to come up for consideration in the Senate without a 60-vote cloture threshold. H.R. 3762 would repeal key parts of the Affordable Care Act: the individual mandate, the employer mandate, and the Independent Payment Advisory Board (IPAB), and would defund Planned Parenthood for one year. The Senate will be in on Wednesday evening and will begin consideration of the bipartisan “Energy Policy Modernization Act” (S. 2012). The bill's lead sponsors are Chairwoman of the Senate Energy and Natural Resources committee, Lisa Murkowski [R, AK] and Ranking Member Maria Cantwell [D, WA], who held four hearings to consider 114 individual bills introduced by senators on topics relevant to energy reform: "After weeks of negotiations, this bill represents the common ground that exists for modernizing our energy policies on efficiency, infrastructure, supply, accountability, and reauthorizing conservation programs." Source: Committee release. Efficiency – Energy efficiency provides significant benefits for consumers, the economy, and the environment. The provisions in this title include agreements on everything from longer-term utility energy service contracts to the reauthorization of the weatherization and state energy programs. The efficiency of our homes, buildings, and manufacturing facilities all stand to increase as a result of it. Infrastructure – We depend on electrical transmission lines and other infrastructure to transport energy from where it is produced to where it is used. This title will help modernize our electrical grid, enhance cybersecurity safeguards, maintain the Strategic Petroleum Reserve, provide a streamlined process for natural gas export projects, and ensure a qualified, well-trained workforce. Supply – To provide for an energy supply that is increasingly abundant, affordable, clean, diverse, and secure, this title focuses on the development of renewable energy, traditional resources, and non-fuel minerals alike. 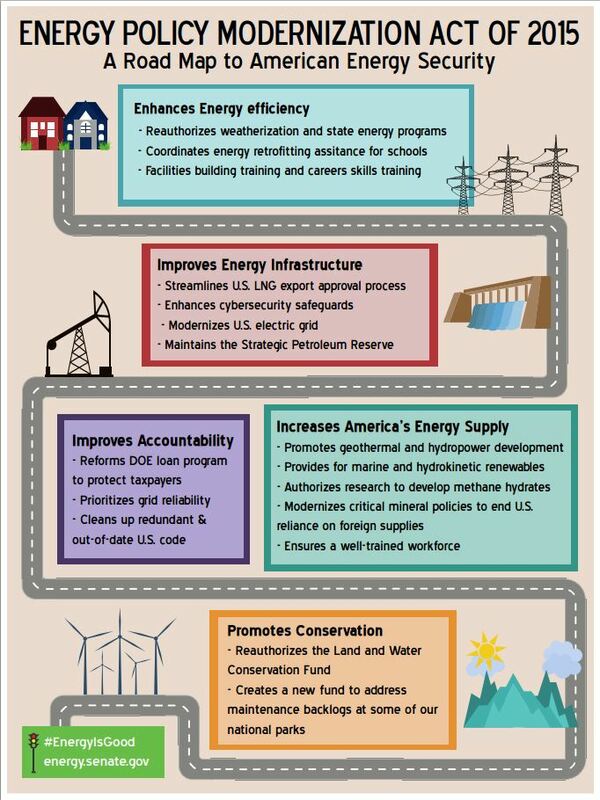 The responsible development of American resources – including hydropower geothermal, bioenergy and rare earth elements – will strengthen our economy, competitiveness, and security for decades to come. Accountability – Practical reforms are needed to advance innovation, protect electric reliability, and ensure the proper stewardship of taxpayer dollars. Among the provisions in this title are the reauthorization of certain energy-related components of the America COMPETES Act, better interagency coordination of energy/water initiatives, and the repeal of numerous provisions within the U.S. Code that are outdated or redundant. Conservation Reauthorization – The Committee is also responsible for oversight and stewardship of our public lands. The bipartisan legislation permanently reauthorizes the Land and Water Conservation Fund in a way that balances land acquisition with other conservation programs important to states and permanently reauthorizes the Historic Preservation Fund, both set to expire this fall. It also creates a new National Park Maintenance and Revitalization Fund, to address the maintenance backlog at some of our nation’s most treasured public places. "McConnell used Rule 14 to place the ISIL AUMF directly on the Senate calendar rather than going through the committee process. This means that the Senate can take up the bill at any time," explained Cody Poplin on Brookings' LawFare blog. S.J.RES. 29: A JOINT RESOLUTION TO AUTHORIZE THE USE OF UNITED STATES ARMED FORCES AGAINST THE ISLAMIC STATE OF IRAQ AND THE LEVANT AND ITS ASSOCIATED FORCES. References beheadings of journalists James Foley and Steven Sotloff, deaths of Army Master Sergeant Joshua Wheeler (the first U.S. service member killed in action in the U.S. military campaign against ISIS) and American aid worker (and former Army ranger) Peter Kassig, American hostageKayla Mueller, Pope Francis's call to action to stop ISIS, and ISIS threat to attack Washington, DC.